Corvus and Oisin can be limpbuddies. If he runs too much his shoulder acts up. Track! Nice to meet her in the Forest today (: Cassie and the kids enjoyed her company! Thanks both of you, it was fun. avatar by the wonderful Shenzi1! Here is fine! There is also my rp blog which seems to have been forgotten (and I keep forgetting about it myself...) but either way is fine. A golden figure danced upon the sleepy and melancholic blues of the forest. It had been raining non-stop in the forest, however the doe used this brief moment of stillness to stretch her legs. She had been prancing alone in the Birch forest, enjoying what would be another's hindrance to travel or entertainment. Her slippery feathers left her no worry of being drenched in rain; it slid right off her as if she were smooth carved ivory. 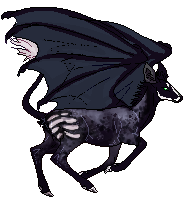 As a matter of fact, there were many details about the winged doe that were peculiar and mysterious- such as her iridescent blank eyes that now gently rested upon the auburn floor of the Birch, or her small freckled wings that stretched on either side of her fluffy form, hovering perpendicular to the ground. She ambled through the Birch, the grass nearly grazing her chin. The doe took slow, light steps, as if a single crunch of her hoof could disrupt the ethereal peace of the forest. The feathery one focused on her breathing, taking deep inhales and exhales, trying to feel the pulse of the woods. It wasn't that Oisín minded the rain, but being constantly wet got tiring after a while. And even though his stiff leg felt better in the cool water of the pond, this kind of weather seemed to make it worse. It seemed that no one liked being in the rain, as every spot that could offer shelter was already occupied, in some cases just about packed full. His leg was starting to hurt from walking around by the time the large rocks of the playground came into view. He was hoping there would be room there, or that at least the larger rocks would provide some semblance of protection from the elements. When the sight of gold caught his eye, his curiosity turned him away from his intended destination, and he moved just close enough to see the feathered doe. She had an unusual, almost ethereal, look, even among the myriad of creatures that could be found in the forest these days. But he wasn't sure if he should try approaching her, opting to watch for now instead. The doe slowed as she reached for a stray bushel of blackberries among the tall grass. The doe's wings fluttered slightly at the discovery, as it was a rarity to find any sort of berries outside of the Blue Bowl. She plucked a few berries and chowed them down rather quick, only just realizing she was starved. The doe shrugged off a bundle of blackberries with her curved horns and let them dangle over them-- a snack for later. As she gave a lethargic yawn, the feathered one glanced around, noting a hint of a stranger's scent beneath the hint of blackberries in her space. Oisín hadn't really thought about it, but he realized he was hungry. Still, when he saw the doe looking around, he stepped back automatically, worried she'd think he'd been staring (which he kind of was). But his bad leg caught on a small rock, and he lost his footing, slipping on the wet grass and falling backwards so that he ended up in a sitting position with his rump on the ground. Hoping no one had seen that, he struggled to get up, finally managing after a few tries. Now, of course, his leg was hurting more than it had been. He might just have to deal with the rain and find a place to rest. Her prediction of a stranger in her midst was revealed true, as she immediately heard a deer rustling and staggering in the distance. The doe's curiosity grew stronger. She began to make her way towards the noise. Parting the tall strands of grass beneath her, she called, "Are you okay?" Right after, the stranger had rose to their hooves. The reveal had shone the stranger was a stag much taller than she, and so the feathery one stopped where she was-- a couple yards from him -- and looked straight at him. Her eyes glittered iridescence with a milky haze of gold, and her golden nose piercing sparkled in the little light of the forest sky. One might assume she was blind from the blankness of her eyes, but the way she gazed with a keen and eager delight very much proved the opposite; like she could tell stories with a look alone. "Ah, finally a new face around here," the doe with relief, mouth curving. "Or perhaps you've been here a while and our paths never crossed til' now. Doesn't matter anyways- hah... Blackberry?" 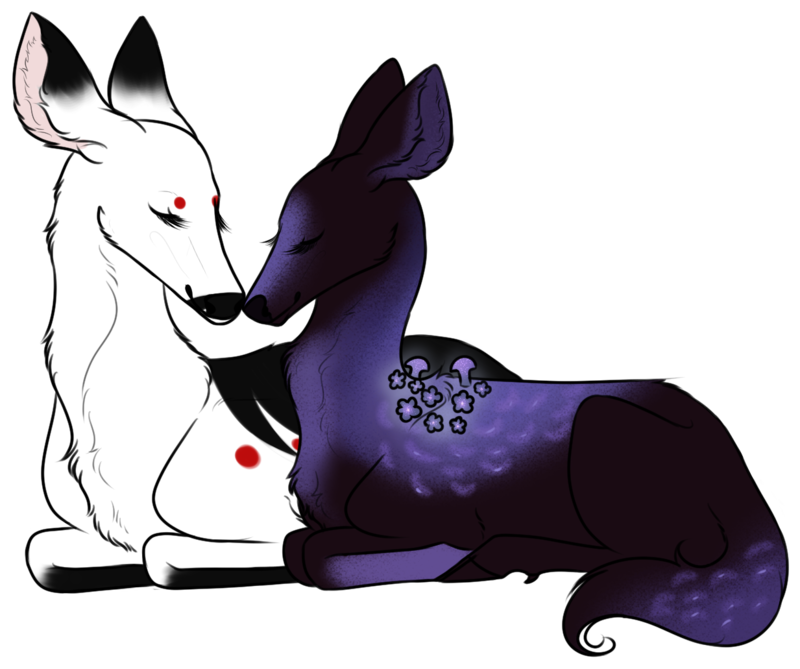 She leaned towards him a bit, dangling the blueberries that hung from one of her arched horns. "I-I'm fine." He was flustered by having been caught, but remembered his manners and bowed. It was difficult to keep his eyes off her, especially being able to see her more properly now. He was especially drawn to her strange eyes, finding them almost mesmerizing. He turned his head slightly to the side, while mentally berating himself from staring. "I've...been around a while. I just don't really stand out." Unlike this doe, and he wondered how he hadn't seen her before. "My...my name is Oisín. Milady...?" He looked at the fruit. "You don't mind? They look very good." Bayleen observed the stag's subtle mannerisms keenly and began solidifying some first impressions; this was something she did frequently, be it stranger or friend. In her mind, she decided he was on the shyer side-- though Bayleen was no stranger to timidity. As a matter of fact, most she had met in the forest -- in her experience -- were on the introverted side. This gave her the opportunity to draw a stark observational line between their reserved behavior, and her near-overwhelming amiability and openness. Her thoughts were snapped back to the present when she caught him say "milady." One of the doe's eyebrows shifted up in surprise. "'Milady?'" Bayleen remarked with amusement and flattery. "Wow, I'm feelin' quite fancy right about now. I've never been called that in my life!" "Though," she added with a joking wink, "I would've preferred 'Thine Goldness' instead." "No, please help yourself!" the feathery one coaxed, leaning closer. "This forest is teeming with fruit, I'm sure I'll find more." Oisín smiled, taking a few of the offered berries. It would be rude to refuse, after all, and they were good. "Thank you very much, milady." A hint of amusement was added to his smile, considering what the doe had just said a moment ago. "Or should I say 'Thine Goldness'? 'Tis really a matter of politeness of address. And a long-time habit, though the meaning is by no means lessened for it. Still, if you have any other name, I would like to know it." It was clear the stag was feeling more at-ease now. In most cases, his shyness around anyone unfamiliar tended to not last long if they seemed friendly. 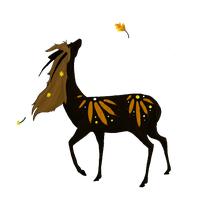 It helped that talking to the golden doe only made him want to learn more about her. Bayleen, pleased he took a few berries, smiled with satisfaction. "Good, huh?" She turned herself a bit so that she was standing beside him, rather than in front of. Looking out into the deep auburn abyss of the Birch, the doe seemed to be enjoying the spacious view before them. "I am called Bayleen," she spoke finally. Giving a warm chuckle she added, "Though, of course, I wouldn't mind 'Thine Goldness.'" "Perhaps Lady Bayleen would suffice? 'Tis a lovely name." He smiled and bowed a second time. "Most pleased to make your acquaintance, Lady Bayleen. Would you care to accompany me in finding shelter from the rain? I would not mind it, except the weather seems to have an adverse affect on my bad leg." He winced slightly, lifting the affected leg so just the tip of his hoof touched the ground. "Also, it seems to have been made worse by my clumsiness..."
Bayleen gave a curtsy of sorts, tilting a leg forward and extending her wings as if in welcome. Then she looked rather concerned towards his leg. "Of course, of course! Let's get the hell out of here," Bayleen began to usher Oisin towards the Playground. In the distance she saw the diagonal rock that created a den beneath it. Someone seemed to be sleeping inside. "If we're quiet enough, I don't think that person should mind us taking shelter there. But we should hurry in case the rain decides to pick up again." Oisín moved slowly, his limp worse than usual. He was glad to see there was still plenty of room under the slanted rock. He didn't want to wake whoever it was that was sleeping there, and was hesitant, but decided Bayleen was right. And there was no telling how long the rain would last. He remembered from the past that it could go on for days here. He crept under the rock while keeping as much distance as possible from the sleeping figure and shook his coat off before laying down carefully to avoid injuring his leg further. It was still damp here, but at least it beat being rained on. His front legs stretch out and he lay his head tiredly on them. Bayleen assisted Oisin with a gentle touch, cautiously placing a wing over his back and softly pressing up against his weaker side for support. Bayleen sensed his pain and lay beside him. "Is there anything I can do to help? How long has your leg been injured?" Oisín wasn't sure how to feel about the gesture at first, not used to being so close to anyone he didn't know well. But the support was appreciated. There was a short, dry laugh in response to the question, and a wry smile as he shook his head. "It's troubled me for as long as I can remember. Most of the time 'tis not painful, merely stiff and difficult to walk on, but some days are worse than others, and moving about does naught to help. I've only been able to find temporary relief. I appreciate the offer, although I'm not aware of any way you could help, unless you are a healer." I swear there's some conspiracy against Oisín to remind him of his old mate, Celeste. A deer with a similar picto. A deer with the same name. A deer with the same set (well with her winter pelt anyway). Decided to give him a mask after all. Reference updated.